Adam Crofoot leading pitch 2 of “Pi Day” – Photo by Anthony Seidita. The cold winter of 2015 seemed to last forever. Perhaps it was the weather, perhaps the weather in combination with the pressures of life. In any case, our plans came to life as the sub-zero spell finally broke. 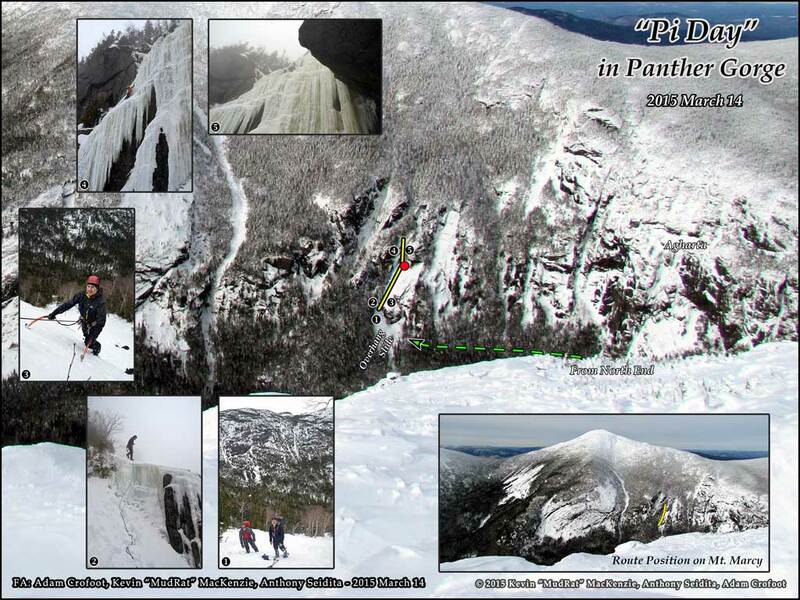 Our thoughts centered on putting up (creating) a new ice climbing route in Panther Gorge. I watched the weather as March 14th approached. The forecast called for temperatures in the 30’s Fahrenheit at our target elevation with a possibility of rain. 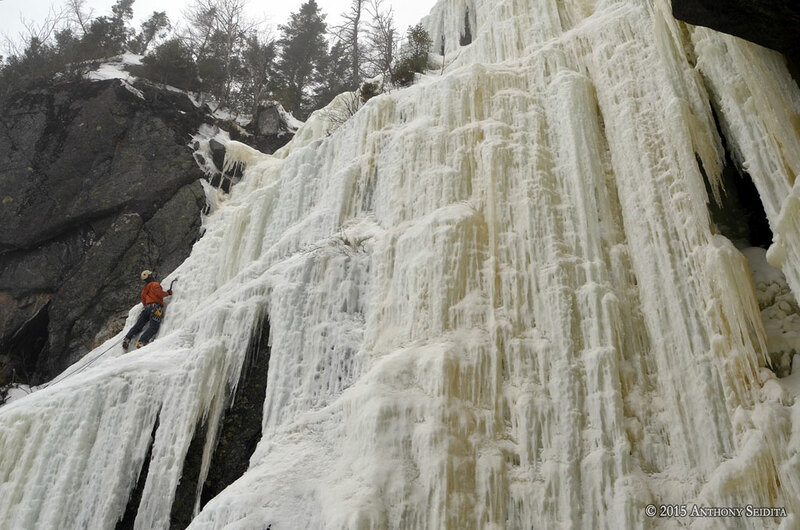 Waiting for a different weather window was pushing the limits of ice season in the gorge, however. I nearly threw the alarm across the room when it beeped at 3:55 a.m. I love alpine starts, but also needed the sleep—c’est la vie. As usual I spent a restless night pondering the uncertainties of the venture—would the snowpack be at least mildly supportive, could we dial in our approach, would the annoying ache above my left knee subside, would the rain be a problem, would the ice be safe…? We’d prepared as much as we could. The rest was in the hands of God and the weather. I met Anthony and Adam at the Loj where we divided the climbing gear to distribute weight; our packs were each around 45 pounds between two ropes, protection and the normal winter necessities. Given the trail conditions we chose to carry microspikes, snowshoes and crampons; another three traction device day to add additional weight. We began walking at 5:00 a.m. on rock hard trails. Fast forward to the bushwhack at 8:30 a.m. We left the Van Hoevenberg Trail high on Mt. Marcy after hiking almost 7 miles. If all went well, we’d thread our way through the cliffs and into the gorge. I can’t stress how dangerous this CAN be if you aren’t intimately familiar with the details of the gorge. It’s not the place to embark on a blind bushwhack—the last thing one wants is to descend 700 feet (especially in unbroken snow) only to find themselves 400 feet above the floor of the gorge. I took the first step off-trail and punched through a light crust to my shin. Spruce traps were thankfully infrequent. The terrain got steeper as we descended from the ridge and found a gully. There are many gullies in the area each with their own outlet; usually onto the technical climbing walls. Even high on the ridge there were obstacles, smaller ledges draped in ice. Adam eventually took point as Anthony and I checked the heading at regular intervals. We soon found our jump-off into the gorge—ropes wouldn’t be necessary in these conditions. A ridiculously steep gully led ever downward. Unsupportive sugar snow under a surface of crust made the descent a challenge. By now we were wearing crampons and they served us well. 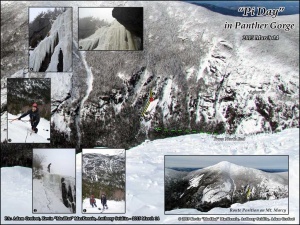 On a side note, Pi = 3.141592653… We were struggling down the gully at 9:26 a.m.—and 53 seconds on 3/14/15. Ok, I’m done channeling my inner geek. We passed beside a wall that got ever taller as we descended into the heart of the gorge. The lines here were not covered in ice so we continued lower. Walking became easier as we reached some avalanche runout. It was like walking on blocks of concrete. We changed direction after climbing around a buttress and headed north to what I call the Overhang Slide. This is a relatively short slide with two large overhangs, one at the bottom and one near the top. I thought back to when Anthony and I enjoyed lunch on it last June. 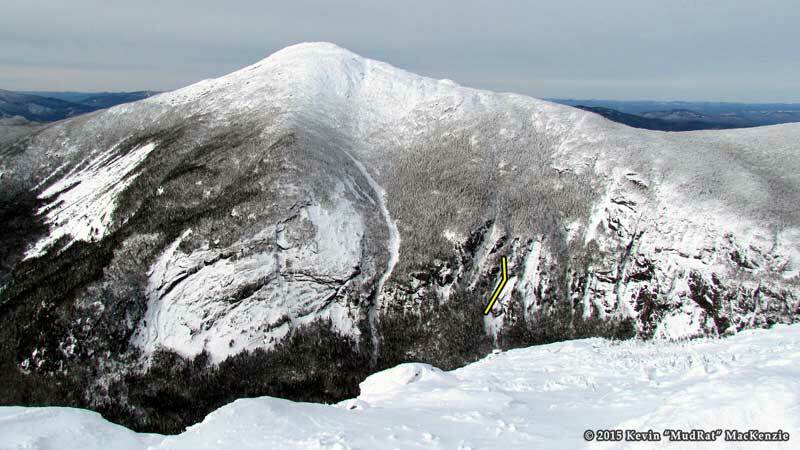 Adam and I climbed a portion of this during our last visit on December 7, 2014. I find it to be a place of particularly magnificent views. 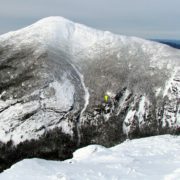 Note: This is probably best accessed from the northern pass by continuing 800 feet southwest of the Agharta ice route. We descended to the glade near the lower overhang and stared up at the wall of ice near the top, an enticing climb. We’d found our climb. I relaxed and scanned the gorge. 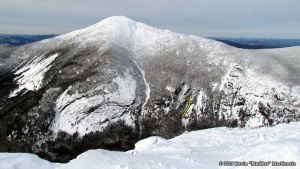 The view north was largely occluded by trees, but Haystack loomed high and mighty across the way as small wispy clouds drifted across its summit. The beaver ponds to the south contrasted against the dark forest. I thought of the many people over the years who have gotten lost on Mt. Marcy and wandered into the gorge only to need rescue or, in the worst case, recovery. This is both a beautiful and unforgiving area. Adam began the route with a short vertical ledge preceding the low-angle slab. A couple hundred feet higher, he set up a belay from a tree near the upper overhang. Anthony and I climbed the snow/ice at the same time, each on our own rope. It felt odd being on a rope since this is the type of terrain that I normally solo. We surveyed the scene from the anchor near the upper overhang. 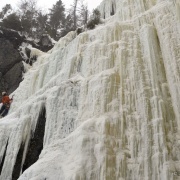 The ice was beginning to rot so the purely vertical pitch was out, but there were several other options. The cloud ceiling was in the process of lowering, Haystack had disappeared. The cliffs to the north, however, were still in view. The great ice route of Agharta was in shambles with only the top intact. The slabs were free of winter and wet with runoff. The fog up-drafted as Adam climbed the left-hand side of the icy wall. It was tedious work as he chipped through the rotten ice to place the screws into more substantial ice. It was an appealing line that included some short vertical sections and a couple small ramps. He led it to the top left-hand corner of the wall. By now the gorge was socked in and a light sleet had transitioned to rain. Thank God for protective layers. Adam belayed me as I climbed. From the top, the view was obscured yet awesome. Anthony climbed next. I listened to the wind and the sound of ice falling as he chipped his way up—this is what I consider serenity. The rappel down to our packs at the lower overhang went without incident. Our route, “Pi Day”, was completed by around 1:30 p.m., but the day was far from over. We ate lunch and contemplated our exit; it would be grueling. By the time we reached the bottom of the gully again, I was thankful for the avalanche debris—finally something stable underfoot before the crux of the exit. The next 300 feet of ascent over 450 ground feet was heinous and spent on all fours digging for traction. Adam was in the front climbing like a phantom in the fog. An occasional chunk of crust bounced off my helmet so I knew he was moving. In the meantime, Anthony was reorganizing his pack below. I began to ascend and watched Anthony slowly dematerialize in the mist. Adam used snowshoes, Anthony and I used crampons. I’m not sure which was better, but the ordeal seemed endless. Yup, this is what we call fun, but nothing good is easy! The following 600 feet of elevation gain involved no navigational skills, just retracing our steps and overcoming the occasional ledge of unsupportive snow. It’s amazing how much energy one can expend moving 6 feet. Cresting Marcy’s ridge was like arriving at the promised land. Conditions were windy and the high level clouds were thickening. We reached the Phelps trail intersection at around 3:30 p.m. and changed gear. Adam switched to skis which made his descent fun and relaxing by comparison. We arrived back at the Loj at 5:30 after about 12.5 hours of adventuring over 14.75 miles/4,400 vertical feet. Thus ended another wonderful day in Panther Gorge. A good day is the culmination of good planning and great partners; thanks again to both of you! Boring not-a-climbing report by a guy who thinks we care about his literary skills, followed by a puss out snow climb to the left of the actual icefall. Stick to the poetry websites and leave the real climbing and climbing reports to others. Are you a professional, or do you just take yourself too seriously?